Even though Nvidia explicitly pitches its G-Sync monitors as premium accessories, the GeForce crew doesn’t hold an iron grip over luxurious variable refresh rate displays. 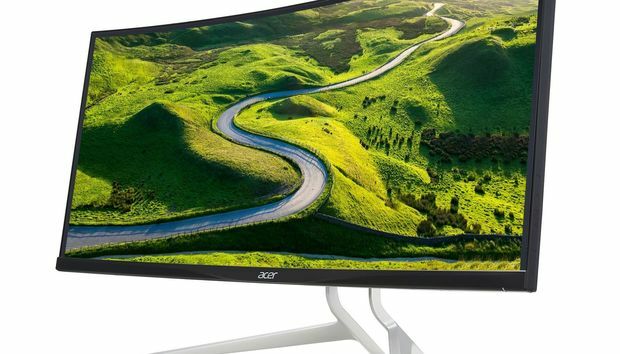 This week, Acer revealed a swanky ultrawide display with AMD FreeSync support and an astoundingly bad name. The Acer XR382CQK’s 37.5-inch screen boasts a 3440x1600-pixel resolution and a gentle 2,300R curve. Combine those with the stutter-killing FreeSync tech and a 21:9 aspect ratio and you’re looking at a screen that screams “immersion” on paper. The display’s rocking a 5 millisecond response time—not great, but definitely not bad—and 75Hz refresh speeds that you’ll probably have trouble hitting in-game unless you’ve got one hell of a rig. That resolution’s no joke. Somewhat surprisingly, the XR382CQK isn’t part of Acer’s dedicated Predator gaming lineup. Acer probably did that for design flexibility; while Predator gear features aggressive black and red aesthetics, the slim and silver XR382CQK utilizes a “ZeroFrame” design with smaller bezels to (you guessed it) increase immersion even more. Acer’s premium FreeSync monitor also supports picture-in-picture and picture-by-picture modes that let you watch input from two sources simultaneously, a nifty touch that takes advantage of the XR382CQK’s size. Other features include preset “GameView” display profiles, wide 178-degree viewing angles, HDMI 2.0, DisplayPort 1.2, USB-C, and a four-port USB 3.0 hub for connecting your gaming accessories. The display also packs a pair of 7 watt speakers bolstered by DTS Sound, but if you’re already dropping $1,300 on a gaming monitor, you’d be much better off investing in a nice speaker system or pair of headphones to go with it. The story behind the story: While FreeSync’s openness has proven to be a major win for AMD in modestly priced monitors, we’re starting to see the high-end fill out, too. At CES 2017 Samsung announced several ultrawide, curved FreeSync monitors of its own, the highlight being the CF791, which looks downright stunning in real life. Samsung’s 34-inch, 3440x1400 display is a wee bit smaller than Acer’s XR382CQK, but it compensates for that with the inclusion of cutting-edge Quantum Dot technology, a more aggressive 1,500R curvature, and a much lower price tag of $950. Decisions, decisions.